Volvo equipment at work for Wade Adams. The company said it has invested heavily in premium machines and large support crews as reliable machinery is a major factor in ensuring that infrastructure projects are finished on time. The company’s fleet comprises 17 pavers, 90 per cent of which are now Volvo. It is also using Volvo for wheel loaders and excavators. In recent months, the company has taken delivery of several 30-tonne Volvo EC300 excavators, ABG Titan 325 and ABG Titan 7820 pavers – the latter fitted with a MB122 screed that allows paving widths of up to 9 m.
“We prefer to focus on just the leading brands, but in the boom of 2006 there were almost no machines available, so we ended up with lots of brands, which was not by choice,” said Issa Ayoub, Wade Adams Contracting’s plant manager for the UAE and Qatar. “Now that things are calmer, we are focusing on just the key brands in each product type,” he added. “Confidence is back but winning work is still difficult. Competition is tough and pressure on prices is very high. Fortunately for us, quality is the biggest criteria for winning contracts, and Wade Adams has an excellent reputation for quality in the bridge building, water works and asphalt sectors. Completing on time is another key criterion,” Ayoub said. Fuel efficiency is an important factor when choosing what machines to purchase, he said. “Fuel is a major factor in our type of work, and can make the difference between winning or losing a tender and making or losing money. This is not always easy to calculate, as fuel consumption can vary by up to 35 per cent between heavy versus light work. The differences on fuel use between brands can be even more than that – up to 70 per cent – and the operator also have a big impact. Volvo has a good reputation in fuel efficiency, and it was an important element in the decision for us to select its machines,” Ayoub explained. To offset this fuel challenge, Wade Adams has introduced a fuel management system that involves eco-operator training and selects the most fuel-efficient brands. In order to get the best out of the machines, maintenance also plays an important part, according to Wade Adams, which has more than 450 people in its maintenance department, and tries to do everything in-house. 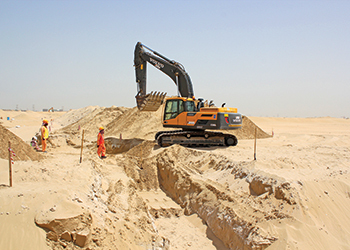 With a very healthy backlog on its books, Wade Adams Contracting is involved in projects ranging from providing shallow services and internal roads for the Reem Oasis Development to building roads and a sewage network for the huge man-made Deira Island project. 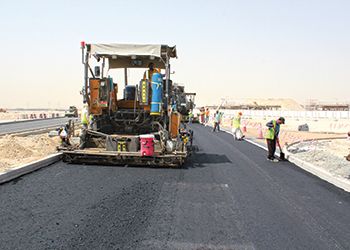 One of its larger current projects involves improving the Sheikh Mohammed Bin Zayed Road. Once completed, the road will form the gateway to several mega projects, including International City, Arabian Ranches, Dubailand, Dubai Silicon Oasis, Global Village and Sports City. Since it began contracting in 1976, Wade Adams has grown to become one of the Middle East’s largest contractors. It specialises in large-scale infrastructure projects, such as dams, water pumping stations, roads, bridges and service installations.